New Process, chain-driven transfer case input gears really warrant their very own topic. There were some forty different variations of them made by NVG. 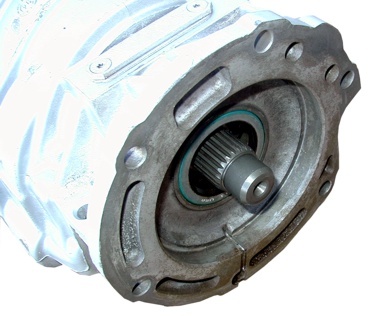 The important variations to look for in the 231 transfer case are in the input gear. The 231 comes in 21 spline and 23 spline versions with long, medium (rare) and short variations. The long shafts protrude 2.1" from the front mounting face of the transfer case. The short version protrudes 1.2". The rare medium shaft protrudes 1.7". You should be careful when swapping any of these gears due to different bearing widths and gear teeth. The following chart shows how to determine which input gear you might have by transmission. It is always recommended to verify first hand if possible. Because of differences in the cut of the gear, as a general rule, one should not interchange 1987-1993 gears with 1994-present gears. These years are not always hard and fast delineations. If one is not absolutely certain, disassembly and inspection is required. Note that some transmissions change spline count. The Peugeot BA10/5 had both 21 or 23 splines. The AW4 had 21 splines through 1990. In 1991 (the same year the 4.0 HO was introduced) the AW4 splines increased to 23. 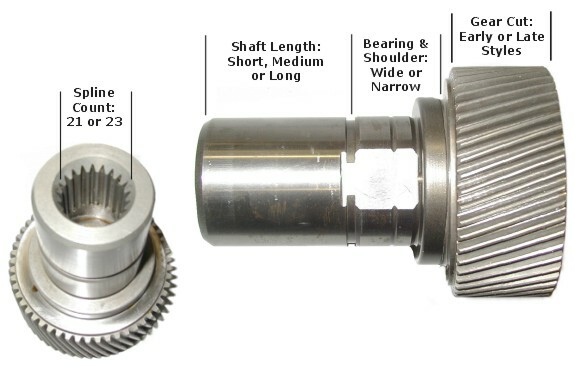 Be certain, in any interchange situation, that you select the right length of input gear for the factory style transmission being used; e.g., a long input gear against an AX15 (usually requiring a short input gear) will cause interference at the end of the splines and put damaging thrust pressures on the transmission mainshaft and transfer case input gear. However, if you are using a Novak transfer case adapter assembly, they are engineered to work with both long and short input shafts, though installers will acheive optimum strength spline engagement with the longer input gears. 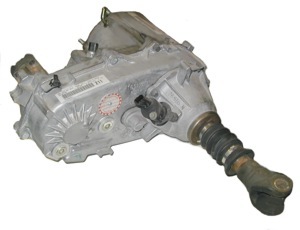 Unlike all other known transmissions to the Jeep New Process transfer cases, the Torqueflite 42RE transmission as found in 1994 ZJ Grand Cherokees features a unique output shaft with a pilot tip on the end of it. This shaft pilots into the NP input gear in a front-facing caged needle bearing. Note the image below. We once spoke with an Engineer at NVG. We questioned him as to why there were so many (forty-something) input gear variations in this popular series of planetary-reduction transfer cases. We told him that it was making our lives harder than we'd like. He responded, "Yeah. Isn't it ridiculous?" He went on to mention that he was part of a company committee whose goal it was to cut the number of gears available down to about seventeen versions, instead.